It is often easier to induce astral projection having first induced sleep paralysis. By the time you have finished reading this to the end, you will know everything you need to know to do this yourself. Sleep paralysis is quite easy to induce, because you already experience it around four times each night, although you probably are not aware of it. I would expect you to have some level of success on your first attempt unless you are very tired. Extreme tiredness will make it entirely futile to try, because you will keep falling asleep. In this case, I would recommend that you put your efforts into restoring your natural energy levels, aiming to get a minimum of six to eight hours of sleep per night for at least a week. So, what is Sleep Paralysis? When we talk about sleep paralysis, we are generally talking about when a person’s mind wakes up, while their body is still asleep, before rapid eye movement (REM) sleep is finished. This can be involuntary, and involuntary waking sleep paralysis affects around 8 percent of the general population on a regular basis. It affects people of all ages but is most common in teenagers and young adults. Additionally, around 25 percent of people have sleep paralysis once or twice in their life. This is not considered to be a dangerous or harmful medical condition and should pass in a few seconds or minutes, but can be very frightening. During rapid eye movement (REM) sleep, the brain has vivid dreams, while the chemicals (inhibitory neurotransmitters) glycine and gaba are released to “turn-off” the muscles of the body. This is a normal part of the sleeping process, and is nature’s way to prevent you from acting out your dreams. So, in one sense, sleep paralysis is so ordinary that everyone experiences it during their normal night’s sleep, every time they reach the REM stage. And since you typically enter REM sleep four times per night, this how often you ordinarily experience sleep paralysis. However, when we talk about sleep paralysis as a phenomenon, we refer to waking sleep paralysis. This is a feeling of being conscious but unable to move. When involuntary, it occurs when a person passes between stages of wakefulness and sleep. During these transitions, you can find yourself unable to move or speak for a few seconds up to a few minutes. You may also feel pressure or a sense of choking. Because you are in a dream-state during SP, it shouldn’t come as a surprise that your imagination can run riot during this time. People sometimes see “shadow people” or other frightening hallucinations during sleep paralysis. The night hag or old hag is one such creature people have “seen”. Here, you might feel a presence of a supernatural being restraining you as if it were sitting on your chest or the foot of your bed. Obviously, if you aren’t expecting this, it can be a bit of a worry! If you see or sense something like this, be reassured that you are having “hypnagogic hallucinations” – you are not being attacked. Closing your eyes will help if you are getting disturbing visions. You will still likely find yourself hallucinating with your other senses. Auditory hallucinations may be experienced, with voices commonly heard, along with other sounds less easy to describe. Henry Fuseli’s gothic-horror masterpiece The Nightmare (1781) is a wonderful evocation of sleep paralysis as a demonic visitation. 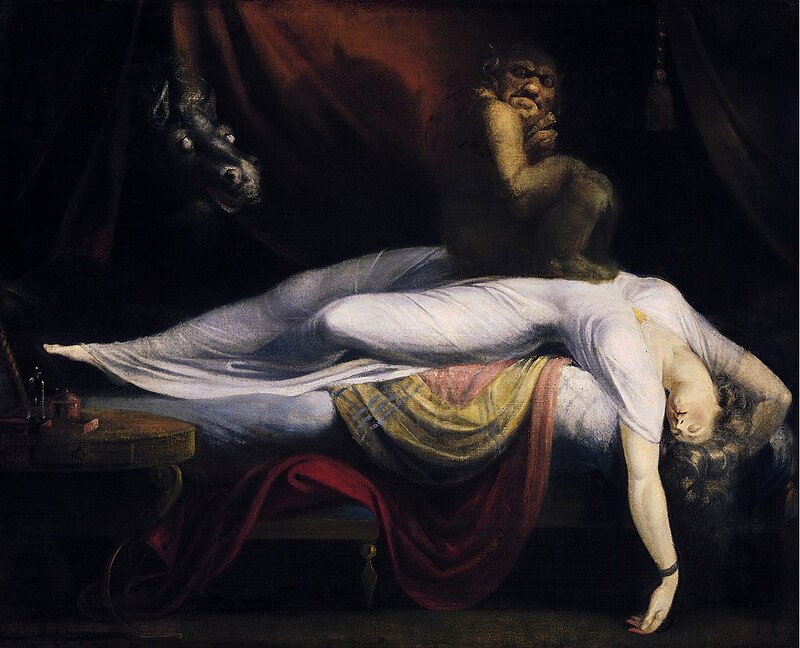 It depicts two demons, one, an incubus sitting on a sleeping woman’s chest, and another, horse-like presence, at the foot of her bed. Nonetheless, there is nothing demonic about the experience, and be assured you are not opening yourself up to any attacks from the spirit world. Any visions like these described are just your mind’s way of trying to make sense of the experience. So, unless you are extremely tired, you don’t fall asleep immediately. In fact, your body falls asleep in a series of stages, as you receive “cues” from your mind. You are unlikely to be aware of these, during a normal night’s sleep. Sleep paralysis is your body’s normal way of immobilizing your muscles, so you don’t hurt yourself during your sleep. However, it’s possible to be aware of sleep paralysis, when your mind is awake. Think of this as the opposite side of the coin from sleepwalking – where your mind is asleep, but your body is not immobilized! Ordinarily, your body can’t fall asleep, unless your mind is asleep first. If you want to induce sleep paralysis, lie as you normally would while waiting to fall asleep, but ignore the urges to move, scratch your nose, or roll over and change position. These urges are a normal part of the falling-asleep process, and are cues that your mind is now asleep. So when you ignore these urges, it tricks your body into believing your mind is asleep. Once sleep paralysis kicks in, you will start to notice some unusual sensations. If you are covered with a blanket or duvet, you may experience them as very heavy, weighing you down. It may be uncomfortable, or unnerving. Ignore the feeling, and don’t panic, nor allow yourself to move. Conversely, you may start to experience a feeling of weightlessness. “Vibrations”, as I explained in Out-of-Body Experience Symptoms, are likely, the deeper into sleep paralysis you fall. These can vary from a light buzzing, to a violent shaking, and every stage in between. These may feel so intense that you might assume an observer would be able to tell – but actually you could have someone else in the same room as you, and they would never know! This, clearly, can also be quite frightening, if you don’t know what to expect. Don’t let it distract you, or panic you from your state-of-mind. 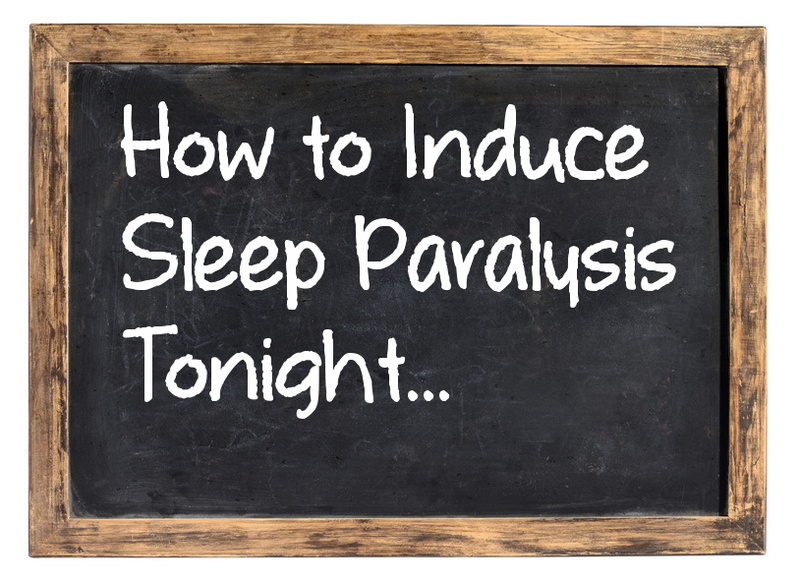 In spite of a number of “experts” suggesting that you simply lie down and wait for sleep paralysis to happen, unfortunately, it often doesn’t work that way. …for nothing much at all to happen. And guess what? You feel discouraged, and you give up, right? The key is to wake yourself up while you are already in the REM state, and then start the process of fooling your body into sleeping, while your mind is already as close to being in the REM state as possible. Your first sleep cycle is around 90 minutes long, and your first REM sleep should occur at around 70 to 90 minutes, and last around 10 minutes. The following sleep cycles are typically longer, at between 100 to 120 minutes long, with a progressively longer period of REM sleep. From the graph below, you’ll see that if you sleep for eight hours, your final REM sleep could last as long as an hour. You need your rest – and there is a greater proportion of deep sleep in your earlier sleep cycles. You will be doing yourself a favor by allowing yourself a proper sleep before inducing waking sleep paralysis, so you don’t want to set an alarm to disturb you during your first sleep cycle. Secondly, in your second two sleep cycles, your REM sleep periods are longer. This means it is more likely that you’ll hit this “sweet spot” with your alarm. Thirdly, it will also increase your chances of remembering the experience. So, I’d suggest that your third or fourth sleep cycle is the optimal time at which to set your alarm. Start with setting your alarm for either 270 or 360 minutes into your sleep. The reason I’ve chosen these times is that on average your REM sleep should start at around 260 minutes for your third sleep cycle, and 350 minutes for your fourth. So I’ve added an extra ten minutes so that REM will already be in progress. 360 minutes also gives you six hours of uninterrupted sleep, which for most people is the minimum they should sleep for optimum health and well-being. Excellent. Now onto the next step. According to studies, sufferers of sleep paralysis are far more likely to be sleeping on their back, also known as the supine position. In fact, around 58% of people who experience SP say they tend to sleep on their back. So, if you wish to encourage this phenomenon, then it stands to reason that sleeping on your back will increase your chances of success. …But when you are drifting off to sleep, there are some subtle physiological sensations. Keep telling yourself that you are starting to feel cooler, starting with your extremities, and working your way towards the center of your body. Meanwhile, allow yourself to observe how your arms and legs are feeling heavier and heavier. Next, you’ll maintain your focus on remaining awake, while making sure that you don’t allow yourself to move, or respond to any of your body’s “tests” to see if you are still awake. Keep calm during the “vibrational” stage, and allow SP to happen. Because at this point, you are so close to the REM state, it should be quite easy. So, you’ve now learned what sleep paralysis is, how and when it happens, and also how to induce sleep paralysis simply and quickly. The more you practice inducing sleep paralysis, the easier it becomes, though if you use this method, you ought to have some success on your first attempt. It’s just one stage of the process of having an out-of-body experience, but in my view the most ignored. Focus on a dream you would like to have, and experience a lucid dream, or use one of the out-of-body experience techniques to “launch” yourself from your body, using one of the OBE techniques I have described! Can Binaural Beats Help You With Astral Projection & Lucid Dreaming? A lot of readers have contacted me to ask about Binaural Beats, and whether they help with Astral Projection. Everyone likes short-cuts – I guess we all sometimes want to find that shiny, magic button that will instantly achieve our goal for us. The truth of the matter is that Binaural Beats can be extremely beneficial to the student of Astral Projection and Lucid Dreaming, just not as much as some people would have you believe. Certainly, Binaural Beats (along with the alternative Monaural Beats and Isochronic Tones) can help you to reach a depth of meditation that is simply impossible for many people. Traditionally, years of practice, discipline and dedication have been necessary to reach the deepest trace states. But it’s now possible to meditate like a Zen Master even if you don’t have hours of time to spare each day for your spiritual growth. Physical Relaxation – without this, you’re unlikely to reach a suitable trance-state. Remembering, and learning from your experiences, successes and failures. So, you see, Binaural Beats can only ever play one part in your success. You’ll still have to do some of the heavy lifting! That being said, learning to induce a deep trance is for many people one of the most difficult and unnatural parts of mastering Astral Projection. And anything that can give you such a huge head-start has got to be worth a go, right? One definition of binaural beats or binaural tones, is that they are auditory processing artifacts, or apparent sounds, caused by specific physical stimuli. Physicist Heinrich Wilhelm Dove discovered, back in 1839, that when one tone of one frequency was played into one ear, while a tone with a different frequency was played into the other ear, a strange effect occurred. To reconcile the two, conflicting, sounds, the mind of the subject “creates” a third tone, that is the exact difference between the the other two tones. For example, if a frequency of 100 Hz is presented to your left ear, and a frequency of 105 Hz is presented to your right ear, your brain “hears” a third frequency pulsing at 5 Hz, the exact difference between the two frequencies. If binaural tones were just a trick our minds play on us when presented with two conflicting sounds, that would be mildly interesting , but not much use to us. However, what happens as a result of the newly-created tone is quite fascinating. When the brain starts to “hear” the binaural beat, it also begins to resonate in tune with that beat. This means that it is possible to create a beat that will cause the brain to resonate at a frequency of your choosing, and guide your mind into activity in any any state you like. …and, yes, help us to reach a state of deep trance perfect for Astral Projection! They are very well-tested, and have been found to be very safe. But there are some instances where you’d be advised to steer clear of them. If you suffer from epilepsy, then there is also a chance that binaural beats could trigger a seizure. Also some of the brain entrainment programs using binaural beats can leave you feeling quite “strung-out” and emotionally-drained. Holosync by Centerpointe is an example of this – it’s an excellent, and highly effective program (although by no means cheap), but is perhaps too intense for anyone with severe emotional problems. At least that’s what I thought. I’d also add that I am by no means an expert on the safety of binaural beats, and have conducted no studies of my own. So, as with anything, you would be well-advised to do your own research first, if you have any concerns or misgivings. What Types of Binaural Beats Are There, and What Do They Do? Alpha – Alpha brain waves are when we are in a state of physical and mental relaxation, but still aware of what is happening. They are helpful for creativity, and also for physical performance. Beta – Beta brain waves are associated with when we are consciously alert – active concentration, active thinking, and also anxiety and paranoia. Delta – the slowest brain waves that we produce, associated with deep, dreamless sleep and lack of consciousness. Gamma – the fastest brain wave, associated with peak concentration and consciousness. There are studies that suggest that applying frequencies in the gamma wave band to sleeping people can trigger lucidity. Theta – This is the area we’re primarily interested in. Theta waves can aid deep meditation, dreaming, the subconscious mind, and creativity. To listen to binaural beats, you’ll need to use head-phones, to properly separate the two frequencies. If both ears hear both sounds, the brain does not feel the need to create the missing tone. Some people find that it’s impossible to relax fully wearing headphones. In which case Isochronic Tones and Monaural Beats will probably be a much better idea for you, as they work with or without headphones. A lot of people find the sound of a pure binaural tone quite unpleasant, so commercially available mp3s will usually have some natural sounds added to the track, like rain, river sounds, bird-song or other relaxing, ambient sounds. The volume of the beats doesn’t really make much difference, so they can be mixed quite low, so all you’re really conscious of is the ambient sounds that are in the foreground. Binaural beats can definitely play a role in helping you to learn to induce an out-of-body experience. It’s certainly not the only way – I didn’t have access to this kind of technology when I started learning, and nor did most other practitioners. But it can clearly speed the process up, and help you to reach the correct trance-state much, much faster. And I believe that with the ever-increasing distractions that modern life brings, most people will find some short-cuts might be helpful. Don’t let this become the only way of meditating, however. Meditation is supposed to be a life-skill, and not reliant on technology. The God Helmet – How Does it Compare to an Actual OBE? Neuroscientists can recreate an OBE by simulating the stimuli to the brain during an OBE. Dr Michael Persinger‘s God helmet, an adapted crash helmet with a number of electrodes on the inside, is used to disrupt the senses, mimicking trauma to the brain in a safe, controlled environment. The idea is that if the results are similar to the Near Death Experience, with its feelings of calm and the visual elements like a tunnel of light, then the spiritual aspects of the NDE may have been effectively explained away. This sort of experiment is NOT something that an OBEer should feel hostile about. The more that is understood about these types of experience the better for the human race, but particularly for practitioners of Astral Projection! Sensory and visual centers of the brain in the right hemisphere are stimulated using electromagnetic fields. The stimuli are safe, and of a lower power than, say, a hair dryer. The subject needs to be in a state of a certain level of sensory deprivation. There needs to be no outside disturbances, and a covering over the eyes is part of the experiment. Results certainly differed from person to person, with creative people such as artists and musicians having by far the most encouraging results. However, it was realized that the best proof of the God Helmet making an effective recreation of a Near Death Experience was to find subjects who had clinically died, and had experienced an OBE. Genuine experiencers of NDE were sought, to try the God Helmet and directly compare the two. If the real and induced experiences were similar, it may mean that the entire experience of OBEs is simply unusual brain activity! Subjects who have experienced both Persinger’s God Helmet and a Bona Fide NDE speak of the similarities between the two, but the mechanically- induced version is far more muted. The images they see are notably more random, and there is no sensation of movement from the body. It has been described as like an OBE, but with less intensity, and without the “Out of Body” bit! Aspects of the OBE are touched upon, but in a much less profound way. Maybe the induced experience is just the first step of many! That science can even start to look into such questions is truly amazing. But it still doesn’t answer the question of what happens when we die. It seems that the God Helmet is a pale imitation of the real thing; but there does appear to be enough similarity for us to wonder if science is getting quite close indeed to unlocking the secrets of what goes on during death! If you listen to a lot of people, you will get the impression that the Out of Body Experience is something esoteric, not understood or studied or taken seriously by science. Although results are not completely conclusive, there is enough evidence gathered by the scientific community to ponder upon. Doctors of cardiology quite frequently come across specific examples of OBEs, experienced by patients on the operating table. Sleep specialists will be familiar with stories of subjects feeling that they left their bodies during an episode of sleep paralysis. Many people who have an interest in phenomena such as the OBE simply seem to have a natural antipathy towards science. They feel that their beliefs are being challenged and debunked. However I am not one of those! Science has a great deal to offer, both now and in the future, and anything that helps us understand the science behind the OBE is a good thing; however it does help to understand that by its nature science has to be impartial, so the methods and language can be a long way off from our experience. Science simply can’t convey, and nor should it, the excitement that we feel. But there’s definitely plenty we can learn. 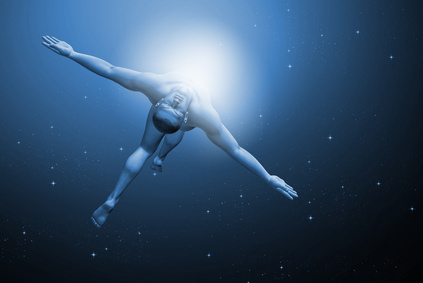 The Out of Body Experience, especially that associated with a Near Death Experience or NDE, is often used as a proof for the existence of the human soul. Some scientists, often fuelled by their own out of body experiences, or those of their patients, have sought to reproduce the effect of an OBE in a laboratory setting. Many people who have an OBE are clinically dead, and typically see a bright light (either a tunnel or living sun), see key spiritual figures from their own particular faith or belief system, and experience a feeling of love and forgiveness. But what does science have to say about the Out of Body Experience, and does it prove the existence of the eternal human soul? It is as important for science to answer the questions about what happens in human consciousness as we go down the path of clinical death as it is for students of religion or the paranormal. Work with cardiac arrest patients, in particular, has helped scientists understand more about what happens during an NDE. Now, scientists don’t necessarily agree that there is proof of a human soul, but they do generally agree that it does provide evidence of extra potential of the human brain. How does science explain the sensations commonly experienced during an NDE? The human soul has a weight and it is 21 grams! Of course it doesn’t and it isn’t. But as a story it still really captures my imagination! The story goes back to 1901, when a Dr Duncan MacDonald of Massachusetts, weighed patients who were dying of TB in a rest home. When it became apparent that they were not much longer for this world, the patients were weighed, with their bed, on an industrial-sized scale. Within moments after death, the results seemed to suggest the patients had lost, on average, 21 grams of weight, which it was suggested was the result of their soul leaving their bodies. His subsequent experiments with animals lead him to postulate that animals do not have souls. The results of his experiments were quite widely published, and remain somewhat in the public consciousness, in spite of being fairly meaningless and without any real merit. His experiments were given a new surge of public interest due to reference to his work in the title of the excellent film “21 Grams“. The film is essentially about its characters’ struggles to come to terms with the weight of a human soul in another sense. Recommend you watch it…but don’t go spouting to people about the weight of a soul; you’ll look like a crazy fool! Scientists have looked at the most common themes that run through accounts of Near Death Experiences. Scientific explanations have been put forward for these; they are not glamorous, but if we are to understand the Out of Body Experience we should be able to consider the possibility that there are rational explanations. In an extreme situation, the human body goes into shock. It doesn’t go into shock in the way that TV shows tend to describe going into shock, often from seeing something shocking, and where a slap to the face may bring the subject to. The body goes into shock in the profound clinical sense. Blood supply is diverted away from some areas, to areas that need more to compensate for blood loss, to maintain body temperature, or whatever else is necessary to keep the subject alive. Blood supply to the retina is reduced, and with it changes happen to the way blood forms on the retina, due to blood loss and oxygen starvation. Blood will move to the sides of the retina, and it is easy to see how that could produce the effect of a tunnel of light, or as in other accounts, the appearance of a “living sun”. This is also no great surprise to scientists. For the same reason as above, when the subject goes into shock, blood supply, and the oxygen it carries, is diverted from the brain. This results in feelings of indifference, calm, resignation and sometimes euphoria. You will have probably heard about people deliberately suffocating or strangling themselves to increase their sexual kicks! Again, this is not too hard to explain. Oxygen starvation, blood redirection creating unusual configurations on the eyes, confusion, trauma, these could certainly combine to create images that would have a particular significance during such an extreme time as we experience on the path towards clinical death. If you have ever stared into a fire, or watched cloud formations create images, it is possible to see why this is not so far fetched. When I was a child, my bedroom had curtains in which I could see all manner of weird and wonderful, and sometimes frightening, things. The fact that the Guardian figures are so personalized also suggests that it is our brain activity that is creating them. For me, there are some major aspects of the NDE that are not explained to my satisfaction. How does science explain the feeling of literally leaving the body, and looking down upon yourself? Most of all, there really has not been a strong explanation of the transformative aspect of a near death experience. Seemingly without fail, those who return to the physical world after experiencing a clinical death, return with something rather more than being simply thankful to be alive! People who return from an NDE are usually profoundly changed, not just emotionally and spiritually, but also physically. Whether you choose to call it an Out of Body Experience or a Near Death Experience, it is certainly utterly unforgettable. People speak of coming back as another person. If a human brain is capable of creating this kind of experience, of tapping into such a life-changing power, and that’s all it is, just brain activity, do you know what? That’s okay with me! It is important that studies are done to help us understand the Out of Body Experience, and necessarily these must be done by scientists. If history has taught us anything, it is that a “clinical study”, when performed by a non-clinical individual, and particularly when they have an interest in getting a certain result, always results in flawed evidence. Every time. But science is still unable to tell the full story. The subjects who experienced near death describe what their sensations were, and scientists look at these descriptions impassionately, as is their job. But the subjects are not talking literally, but figuratively. They are trying to put in words their experience so that other people may understand, but what they are trying to describe is quite beyond words!